Eddie Hall is the World's Strongest Man 2017 and the record holder for the heaviest deadlift in history of half a tonne. . He can lift cars, pull planes, throw beer barrels. Eddie has dedicated his life to reach the pinnacle. The willingness to battle, and then battle some more, is what separates him from the rest. But the journey there has been a long one. Starting out as a championship swimmer, he spent years as a truck mechanic, all the time formulating his dream in his head. He wanted to achieve, to test himself, to take himself to the ultimate, and beyond, in his chosen endeavour. 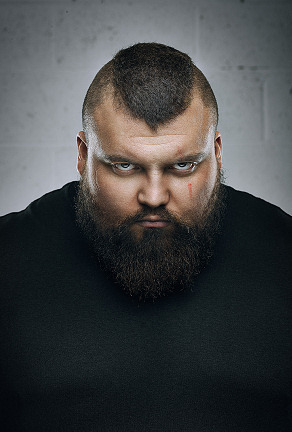 Standing at six-foot-three inches tall, weighing in at close to 30-stone and needing a diet of over 10,000 calories a day to fuel his eye-watering sporting achievements, everything about Eddie Hall is huge. Five times Britain's Strongest Man and six times a UK champion (both records), "The Beast" has torn ligaments, burst blood vessels in his head, and even popped an eyeball out of its socket, all in the pursuit of reaching the strongman pinnacle: a feat which he achieved in 2017 when he was crowned World's Strongest Man. A multiple world record holder, Hall has lifted cars, pulled planes and, in 2016, became the first person in history to deadlift an astonishing 500 kilograms (around 160 house bricks or half a tonne) at the World Deadlift Championships; an achievement that is unlikely to ever be bested. A successful teenage swimmer, Hall switched his focus to bodybuilding at the age of 20 and won his first title (2010's England's Strongest Man) just two years later. He became the youngest winner of UK's Strongest Man in 2011, setting a new national record in the "Viking Hold" as he hung on to 20kg axes in each hand at full stretch for one minute and 18 seconds. 2014 would prove to be a defining year for Hall, however, as he retained his UK crown, added Britain's Strongest Man to his collection, and finished 6th in the World's Strongest Man. The Beast then lifted a world record 462 kilograms at the Arnold Classic in Australia, in front of the tournament's namesake and former Mr. Olympia Arnold Schwarzenegger. Hall finished 4th at the 2015 World's Strongest Man, before breaking his own deadlift record in July 2016: passing out as he lifted an astonishing 500 kilograms in front of a packed Leeds Arena. Yet, despite admitting that the grueling training programme behind his success was an "extreme self obsession" that amounted to "self torture", Hall refused to rule out lifting even heavier if someone were to break his record. Having finished third in 2016's World's Strongest Man shortly after his record-breaking deadlift, Hall was one of the favourites going into 2017's event in Botswana a year later. In the final standings, Hall edged out Iceland's Hafþór Júlíus Björnsson (AKA Gregor Clegane / The Mountain in Game of Thrones) by just a single point to claim the crown. He has gone from being a truck mechanic to a superstar and hopes his story will help others see what can be achieved through dedication and hard work. Eddie was one of the stars on Eddie Celebrities in Solitary on Channel 5 and is currently filming a series for History Channel US, with another project about to go into production.